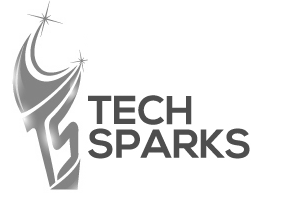 PRODUCTS TECHNOLOGY COMPANY CLIENTS NEWSROOM CONTACT US BLOG WE'RE HIRING! Get Innovation streaming to your finger tips. At Heckyl we cover millions of news sources for you from all over the planet – for over 35,000 companies and 3500+ non-listed entities in 7 geographies. And we don’t stop at that. We keep you updated constantly on Government moves, hedge funds or PE investments, VC deals, economic announcements and more. Our revolutionary technology - with sentiment-tagging, news-clustering and discovery engine - does all the heavy lifting for you and helps you make sense of millions of raw news data points. Real time trending news from the web, government wires, news wires, blogs and Twitter. Get news sentiment and velocity to know the news points making an impact in the market. A fresh way of looking at stocks and the street sentiment. 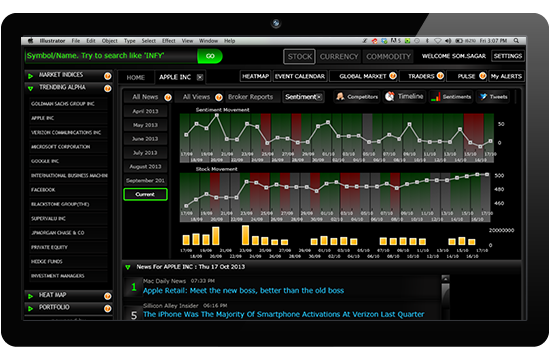 The Sentiment HeatMap allows you to identify changing sentiment and thus helps you read the market in just a snapshot. Quickly scan what is getting the attention of Investors and Investment Houses. 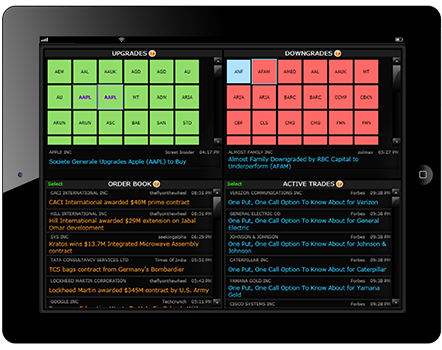 Receive rating alerts, portfolio updates, big trades, analyst and brokerage updates; all in real time. The il Supremo Price Analytics platform awaits you. 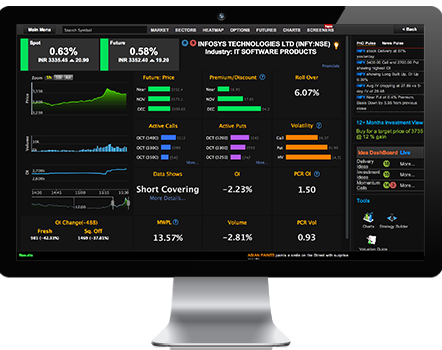 Analyze and trade different asset classes with never-seen-before visuals that enable you to get first-hand insights to make the best trade decisions instantly and smartly. Provided with intelligent tools and trading touch points wherever it matters, you will no longer have to search for opportunities. 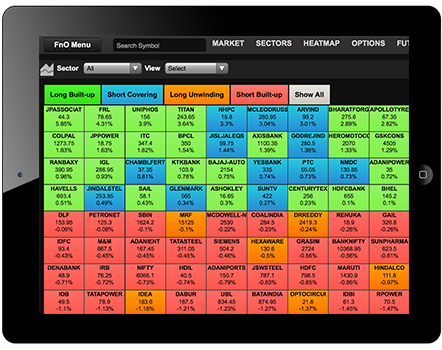 One-click market snapshots of Long-Short Built-up, Volume, Volatility etc. will pack you with the smartest insights and intuitions of the market course and trend recognition. Get a whole new picture of the company activity on the Dashboard. 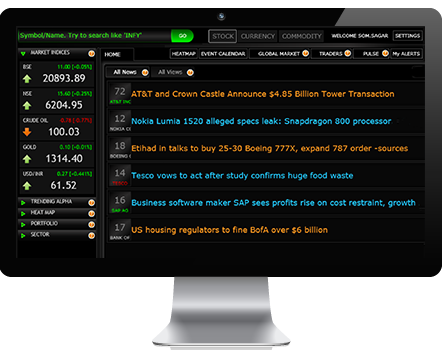 Right from Company News, algorithm-generated alerts, Option movement, unusual activity to Company Research Report – you find all that there is worth knowing about the company on this screen. Complex Option Strategies now made easy. This incredible scanner allows you to specify target price, date and your risk preferences to bring out the best, optimum, low risk strategies for you along with easy-to-understand payoff statistics. 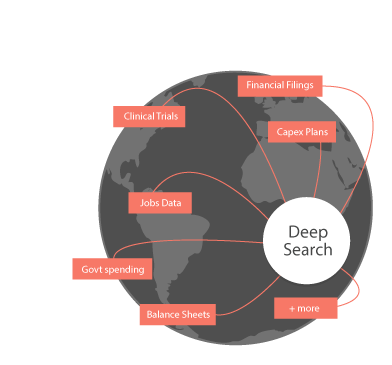 Discovery is the key focus of Heckyl DeepSearch. Heckyl big data engine mines Public, Private and Proprietary data sources to help you analyse, connect and discover the next big opportunity. Research and ask questions to this amazingly intelligent application. It will answer all your queries and suggest you the most relevant content for your research. It’s a whole new galaxy of actionable information now at your fingertips. Our technology is our backbone, our passion, our religion. We use state-of-the-art systems to simultaneously gather data from hundreds of thousands of sources from all over the world and present ready-to-use, actionable intelligence to the user, in real time. Our systems are engineered for performance, reliability and accuracy. Our highly optimized, low-latency, in-memory Market Feed Handler is designed to receive tick-by-tick live Stock Exchange data and perform millions of calculations in real time, to bring you never-seen-before market movement analysis. Our revolutionary NLP (Natural Language Processing) based sentiment analysis engine is carefully hand-crafted, to accurately and efficiently gauge the impact of news on the stock market, in real time. Our carefully hand-crafted Solution Architecture allows us to map relationships between thousands of entities, process millions of records, and offer detailed information about Company Fundamentals, based on more than a billion possible search combinations. It's all about visualization, really. We process millions of data nodes in real time to bring you the most intuitive, insightful graphs and clear visual indicators of dozens of factors that represent and influence stock market dynamics. Your platform, our product. The Heckyl platform can be integrated easily with any existing trading application, so you can continue to use your own systems, and yet offer our revolutionary features to your end users. "Heckyl aims to be a global leader in the space of information analytics for worldwide financial markets. We strive to raise the bar with everything that we offer and shall continue to do so till hell freezes over." As much as we take pride in our testing victories, we never lose sight of the little things that make us who we are. With our core values of integrity, dedication, perseverance, and transparency, we work together as a cohesive and a well-aligned team. We thrive on the fact that we continuously challenge ourselves, working as a closely-knit family. With in-house expertise ranging from Database Architecture, to Text-Mining, to Web Technologies, to Finance, to Interface Design, to comic-book superheroes, we’re a self-sustaining lot! But it’s not all work and no play at Heckyl. We regularly pop open champagne bottles on reaching our milestones, devour cakes on birthdays, and sometimes even make each other pay for lavish luncheons, just for fun! Beer, Cappuccino, and Green Tea flow in abundance in our office, and serve as fuel to help us go that extra mile in everything that we do. Weekend getaways and off-sites help us in staying focussed on our goals, in spite of the blazingly-fast pace at which we accomplish things. We do enjoy reading Dilbert, but red-tapism is strictly forbidden at the workplace, and is punishable by up to 7 years of rigorous coding. You should be creative, extremely energetic, and ready to hit the ground running.You should be ready to thrive in fast-paced environments, work well in a team but also be a leader and an instigator. We love new ideas and fresh perspectives. Heckyl is all about innovation, you should be too. Are you a Web Engineer who's looking to join a company whose DNA is innovation and believes you can make a difference? Have you faced big challenges in building beautiful, easy-to-use, highly scaleable web applications that services hundreds of thousands of users. If so, we think we've got the opportunity you're looking for. Want to join us anyway? Tell us why Heckyl can't live without you! In 2013, UKTI and British Airways Selects Heckyl as the most Innovative Company from India. Heckyl Technologies - Selected as a 2014 Red Herring Top 100 Asia. Heckyl announced as a winner in the 2014 Red Herring Top 100 Global. Heckyl wins Government of Ontario's Next Big Idea 2016 Contest. In line with our philosophy of Knowledge First, today we have made a quantum leap in terms of information reaching across with the help of our state of the art integrated trading platform. 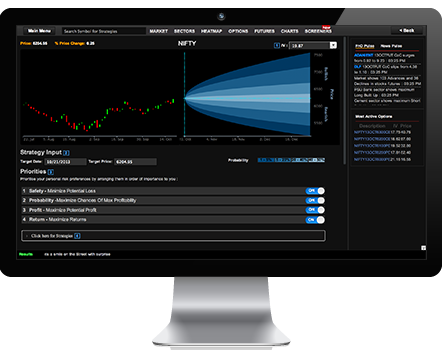 Now we have news and price data analytics from Heckyl streaming at the traders' fingertips. We have achieved this with Heckyl, working as a cohesive team. This platform will greatly facilitate the traders and investors alike, in being better informed and making faster, more profitable decisions. Our partnership with Heckyl not only helps investors and traders in making the right trading strategy, it also accelerates market maturity. "Angel Broking was the first in the industry to introduce the FIND product to the customers. When we first met the Heckyl team, we could clearly identify with them since they shared our passion of providing pioneering & cutting-edge products to the customers. The FIND product has created a benchmark in the industry and our customers have been quite excited about using the product. It provides immediate & relevant news -straight from the source, eliminating the hassle of tracking multiple sources for the client. We are equally excited about the next set of products being developed by the Heckyl team."